Occupational kidney disease: Is exposure to ammonium nitrate a risk factor? A 49-year-old man was admitted with complaints of progressive swelling over body, anorexia, and easy fatiguability for 1 month. His past medical history was unremarkable. The patient revealed that he had been working in an ammonium nitrate factory for the past 25 years. The factory was involved in making commercial explosives prior to the ban imposed on such explosives and fertilizer-grade ammonium nitrate since then. On examination, he was hypertensive (160/90 mmHg) and had peripheral edema. Systemic examination and fundoscopy were normal. Laboratory studies revealed a normal complete blood count, blood urea of 65 mg/dL, serum creatinine of 2.6 mg/dL, and hypoalbuminemia (3 gm/dL). Urinalysis showed active sediment with 24-h urine protein excretion of 3.2 g. Anti-nuclear antibody, anti-ds DNA, rheumatoid factor, Anti neutrophil cytoplasmic antibodies (ANCA), and Anti - Glomerular basement membrane (GBM) antibodies were negative. Serologic markers of hepatitis B, hepatitis C, and HIV were negative. Complement factors 3 and 4 were low. Liver function tests and serum electrophoresis were normal. Ultrasound of abdomen revealed bilateral normal-sized kidneys. 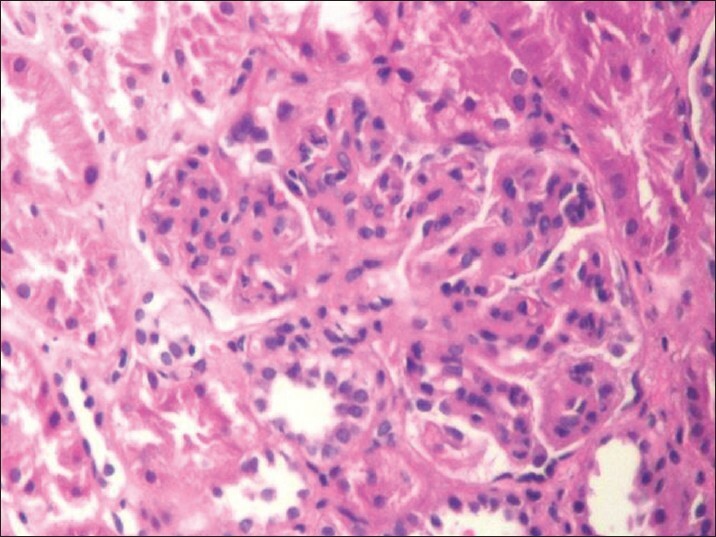 He underwent renal biopsy, which revealed features compatible with type 1 Membranoproliferative glomerulonephritis (MPGN) [Figure 1] without significant tubular atrophy/interstitial fibrosis. Immunofluorescence microscopy showed immunoglobulin G (IgG), IgM, C1q, and dominant C3 deposition in both the mesangium and capillary loops with no evidence of light chain restriction. The patient responded to a course of steroids with normalization of renal functions and remission of proteinuria. The health implications of exposure to industrial chemicals are not stressed enough and the ill effects caused by these solvents are not widely known. Frequent and heavy exposure to hydrocarbons such as organic solvents, fuels, paints, glues, and motor exhausts has been associated with occurrence of glomerulonephritis in both case reports and case-control studies. Majority of initial cases described were rapidly progressive glomerulonephritis with or without anti-glomerular basement membrane antibodies. , A few cases of membranous nephropathy,  IgA nephropathy,  Focal segmental glomerulosclerosis (FSGS)  and subacute proliferative glomerulonephritis were described later in solvent-exposed workers. Ammonium nitrate too is well known to cause significant health hazards, it causes most of its adverse health effects due to its conversion to nitrites leading to methhemoglobinemia and has been associated with nephritis. Ammonium nitrate has many applications, ranging from fertilizers to commercial explosives to rocket fuel. Some common fuels used to sensitize ammonium nitrate for manufacture of explosives are gasoline, kerosene, diesel oil and nitromethane. We rarely look at renal diseases through the prism of exposure to hazardous chemicals. Analogous to occupational lung disease, is it time to think of "Occupational kidney disease"? We need to collect extensive data from people exposed to these chemicals and if they are found to have renal disease, we should try to prove a causative correlation. Brautbar N. Industrial solvents and kidney disease. Int J Occup Environ Health. 2004;10:79-83. Beirne G, Brennan J. Glomerulonephritis associated with hydrocarbon solvents. Arch Environ Health 1972;25:365-9. Daniell WE, Couser WG, Rosenstock L. Occupational solvent exposure and glomerulonephritis: A case report and review of the literature. JAMA 1988;259:2280-3. Ehrenreich T. Renal disease from exposure to solvents. Ann Clin Lab Sci 1977;7:6-16. Albrecht WN, Boiano JM, Smith RD. IgA glomerulonephritis in a plumber working with solvent-based pipe cement. Ind Health 1987;25:157-8. Bosch X, Campistol JM, Montoliu J, Revert L. Myelofibrosis and focal segmental glomerulosclerosis associated with toluene poisoning. Hum Toxicol 1988;7:357-61. Material Safety Data Sheet Ammonium nitrate (MSDS): p. 1-6. Available from: http://www.sciencelab.com/msds.php?msdsId. [Last retrieved on 2014 Jun 05].